Higgins came to Animal Rescue Inc. as a stray in need of medical attention. These days he’s happy, healthy and ready to become your permanent snuggle buddy! Talk about luck! Mr. Higgins found his just in time. 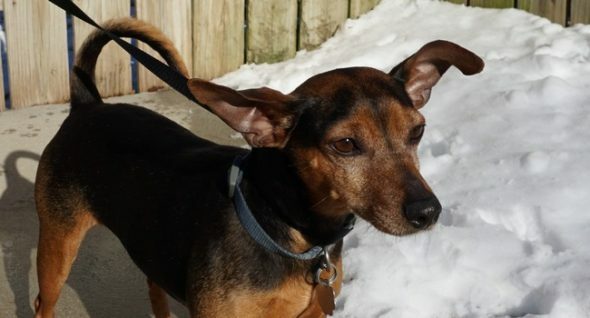 Higgins is a male min pin mix, approximately 7 to 9 years young. He was struggling to survive as a stray in Glen Rock, PA, badly in need of medical care, when this cutie crossed paths with a kind stranger. 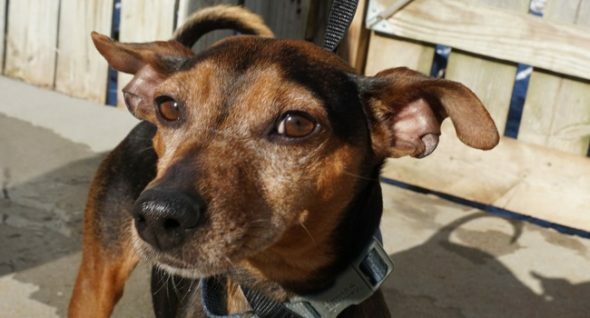 That good Samaritan gave Higgins a 10-mile freedom ride to Animal Rescue, Inc. and it would change this scared, little stray’s life forever. For more than four decades, Animal Rescue, Inc. has been operating a no-kill shelter, or as they prefer to call it, a “Sanctuary for Life” for homeless dogs and cats in the Maryland-South Central Pennsylvania area. Higgins was about to receive all of the veterinary care he desperately needed. That’s because Higgins’ timing was as good as his luck! Higgins is between 7 and 9 years old. 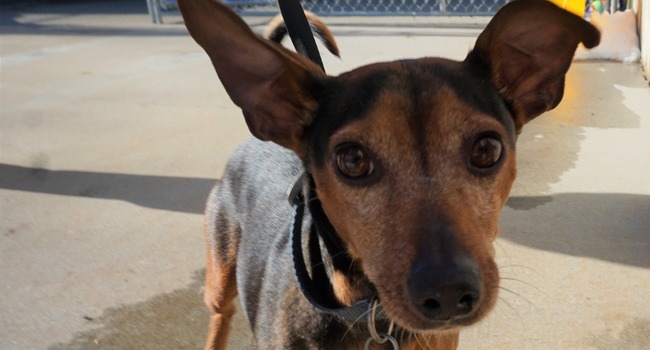 A min pin mix, he’s fully vetted and ready to go home with a very lucky family! Before Higgins was found, the Grey Muzzle Organization awarded a generous grant to Animal Rescue, Inc. so they could provide veterinary care, dental work, and spay/neuter surgeries to make the rescues of older, at-risk dogs like Higgins possible. When Higgins first arrived at Animal Rescue, Inc.’s Sanctuary for Life, it was clear to everyone that he needed to be neutered, but staffers also noticed that Higgins was frequently urinating and his bedding was always wet. Following an ultrasound, Higgins was diagnosed with bladder stones that required surgery. The vet decided to kill two birds with one stone and opted to give him dental work at the same time. In fact, Higgins did so well under anesthesia that they did his neuter surgery, as well. He got a three-in-one and made a fast, full recovery! This little trooper is 16 pounds of pure personality. In fact, Higgins has so much personality that Grace Froelich, Animal Rescue, Inc.’s Volunteer President & Executive Director, said that she was sure someone had to be missing this little guy. Higgins loves people and gets along well with other dogs, but (sorry cat people!) needs a cat-free home. But, as often happens, no one came forward to pick little Higgins up. Now he’s more than ready for a new, forever home. Higgins is an active, friendly dog who loves to play and cuddle. He gets along well with other dogs, but needs a cat-free environment. “We are waiting for that special person to fall in love and adopt our sweet Higgins,” says Froelich. Are you that special person for this special dog? To learn more about Higgins, please visit Animal Rescue, Inc.